If you are thinking of taking your dog out for Halloween and dressing him up, here are some tips. 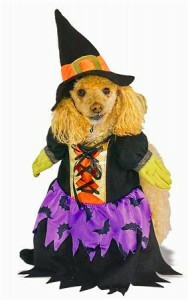 Pick out a suitable costume for your dog and make sure that it fits properly and is not too tight. There are many styles and sizes to choose from. Most large department stores will sell dog costumes as well as the larger pet stores. You may even try shopping online. Get your dog leash and collar ready. Make sure that your dog is securely on his leash. There will be lots of children out at this time. This neighborhood may be busy and this can be a bit scary to your dog. Put reflective tape on the leash or your may even want to purchase a flashing leash which is available at many pet stores. It’s important that you and your dog are seen on those dark streets at night. Make sure that you respect your neighbors. It’s a good idea to bring someone else with you. They can ring the doorbell and say that there’s at dog, not a child at the door. Some homeowners will want to give out dog biscuits and may even want to pet your dog. Make sure that your dog is comfortable around people. Keep your dog away from children who are trick or treating. Dogs can get scared of masks and loud noises. Remember, chocolate can be fatal to a dog. Don’t let the homeowners try to give any candy to your dog. Take some dog biscuits to give to your dog while you are out. Take some pictures that you will treasure for many years to come! This entry was posted on Monday, September 27th, 2010 at 7:07 pm	and is filed under Litter Box, Pet Supplies. You can follow any responses to this entry through the RSS 2.0 feed. You can skip to the end and leave a response. Pinging is currently not allowed.